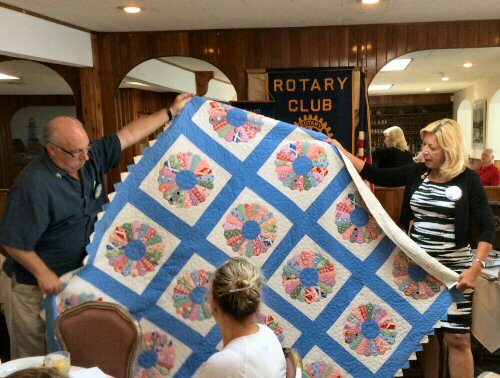 On Tuesday, August 25, Rocky Point Rotarian Ann Marie Roberts provided her fellow Rotarians with a history lesson sharing little known information that African American slaves may have used a quilt code to navigate the Underground Railroad. Quilts with patterns named "flying geese," "tumbling blocks," and "bear's paw" appear to have contained secret messages that helped direct slaves to freedom. Ann Marie shared that the quilt-code theory has met with controversy, but she believed it to be fact after reading several books on the subject. Ann Marie also shared an 80-year old quilt that she recently discovered and purchased at a local antique sale. The quilt is pictured below. Thank you, Ann Marie, for a wonderful and thought-provoking presentation.